Complete Timing Kit With Water Pump. 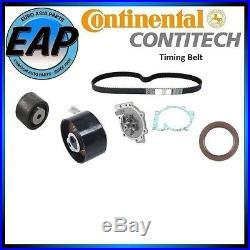 TB319 - 07853014 -OEM Continental Timing Belt. 8692561 - 07953030 - OE Aftermarket Timing Belt Idler Roller. 30638276 - 07953019 - OE Aftermarket Timing Belt Tensioner Roller. 8694630 - 11253017 - OE Aftermarket Metal Impellar Water Pump with Gasket. 6842273 - 22553059 - OEM Front Crank Seal. This listing does not include the Cam Seals. We do have the Cam Seals but unfortunately they are application specific. INTERCHANGE (Vehicles this part fits). Volvo S80 2003 6 Cylinder 2004 6 Cylinder 2005 6 Cylinder Volvo XC90. PLEASE READ BELOW BEFORE PURCHASING! The item "For 2003-2005 Volvo S80 XC90 2.9L 6cyl Timing Belt Water Pump Kit with Seals NEW" is in sale since Tuesday, July 09, 2013. This item is in the category "eBay Motors\Parts & Accessories\Car & Truck Parts\Engines & Components\Timing Components". The seller is "euroasiaparts" and is located in Sacramento, California.